Gloria Ascher doesn’t have a driver’s license. 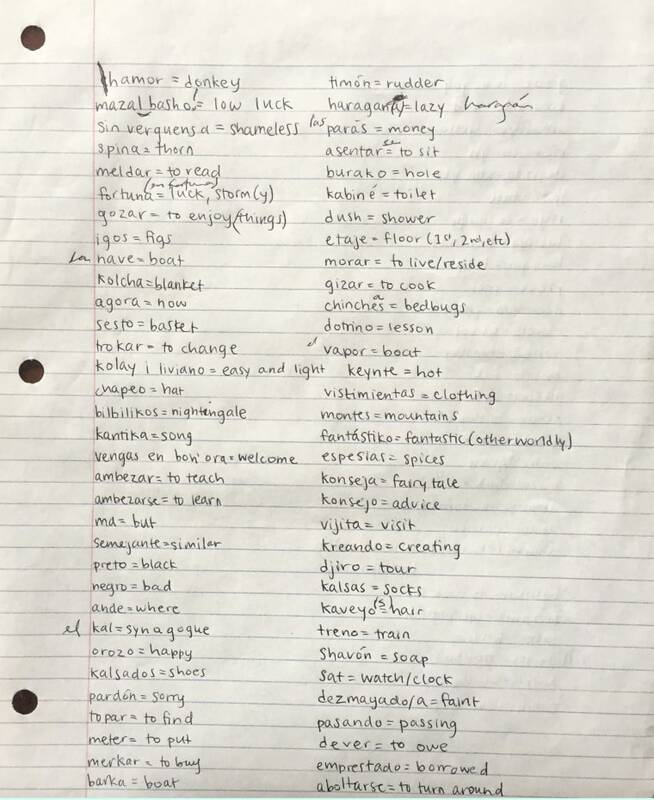 So the 80 miles she has to travel every few weeks from Cape Cod, Massachusetts, to a Boston suburb to teach Ladino, an ancient Judeo-Spanish language, to a single student takes most of her day. But for the retired college professor, who teaches the student for free, it’s a labor of love. Ascher is among a small but mighty global force trying to save a language rooted in Spanish with connections to Turkish, Hebrew, Greek, Arabic and other languages. There are about 130,000 Ladino speakers worldwide, according to Ethnologue, a world language database. Many experts, however, consider the number to be an imprecise estimate and a gross exaggeration. What is not in dispute is that most native Ladino speakers are elderly, and most of their children grew up learning different languages. There are efforts to keep this language alive: Some American universities periodically offer courses in Ladino; Spain recently announced it would create a new Ladino academy in Israel dedicated to saving the language; Ladinokomunita serves as an online forum where hundreds of users converse exclusively in the language; and in Turkey, “El Amaneser,” Ladino for “The Dawn,” is a monthly Ladino-language newspaper with circulation around the world. At a Hanukkah party hosted by a progressive Jewish group in December 2018, rising Democratic star and freshman member of Congress Alexandria Ocasio-Cortez revealed that her family learned it traces its ancestry back to 15th century Sephardic Jews from Spain. Like many other Spanish Jews, her ancestors were forcibly converted to Catholicism, and some family members eventually emigrated to Puerto Rico. The congresswoman then joined the group in singing a Hanukkah song, Ocho Kandelikas. As the clip went viral, the song Ocasio-Cortez, D-N.Y., sang left many on social media puzzled. “Ocho Kandelikas doesn’t sound Hebrew to me,” one Twitter user wrote. Ocho Kandelikas didn’t sound Hebrew because it wasn’t — it was in Ladino. Before the Spanish Inquisition in the late 15th and early 16th centuries, Spain had a large Jewish population, in the hundreds of thousands. The Spanish that Jews in the Iberian Peninsula spoke wasn’t particularly different from that of their non-Jewish neighbors. But as Spanish Jews were made to convert to Catholicism or executed, many families fled to Italy, Greece, the Balkans, Turkey, Lebanon and historical Palestine, where Ladino was born. Ladino was traditionally written with Hebrew letters, but now it’s often written using the Latin alphabet, and its words are spelled how they sound. Those who speak and read Spanish are able to make out a lot of Ladino, save the words that have no relation to Spanish at all. In Ladino, the Spanish “c” is often replaced with “k” — “cuando” is “kuando” and “poco” is “poko.” Instead of using the Spanish letter “ñ,” to pronounce “ny,” the phonetics are spelled out, so the Spanish word “año” (year) is “anyo” in Ladino. Molly FitzMorris, a doctoral candidate at the University of Washington who studies the linguists of the Ladino, said that Ladino isn’t the same everywhere you go. “How much Ladino takes from every language depends on the dialect,” she said. In Seattle, which has a large Sephardic population, it sounds a lot more like Spanish. In Istanbul, Ladino sounds more like Turkish. 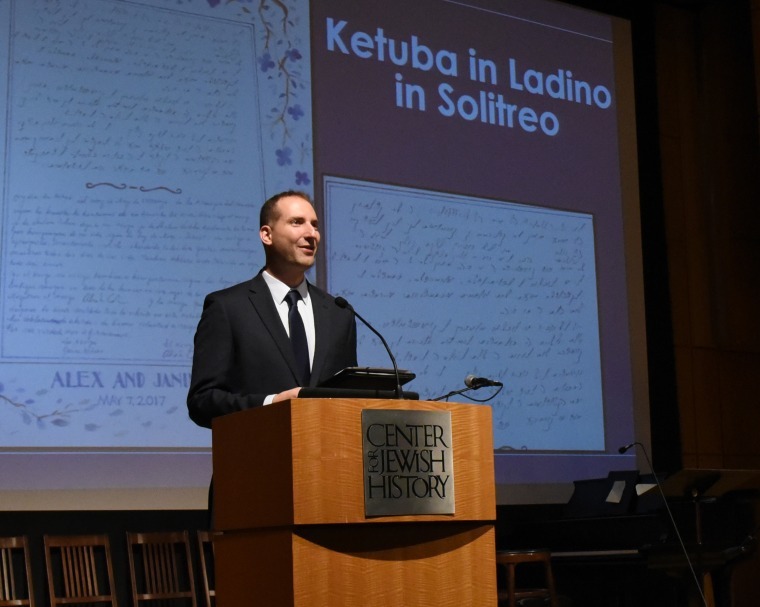 “Genocide, linguistic assimilation and acculturation have greatly affected the vitality of [Ladino],” Kirschen said in a speech at the International Ladino Day in New York City, an event in February meant to celebrate the language and keep it alive. One of the challenges those trying to keep the language alive face is that Ladino lacks a robust archive. “I’ve been struck by what Ladino doesn’t have in terms of a research infrastructure, archives, varieties of books and bibliographies, in comparison with Yiddish,” Ilan Stavans, Amherst College professor of humanities and Latin American and Latino Culture, said. Stavans was born in Mexico; his family descended from Jewish immigrants from Eastern Europe. “Growing up in Mexico, I spent hours with friends in their houses and sometimes I would hear Ladino, but I didn’t pay much attention to it,” he said. Stavans came to the United States and started studying Yiddish. Eventually, he found himself studying Ladino. Whereas in Yiddish there was “enormous voracity to translate,” the same never happened for Ladino, which is famous for its songs and liturgy, but not for its printed culture. This, Stavans explained, was partly because the Sephardic diaspora was “fractured.” Many Sephardic Jews eventually adopted the language of the places where they went. Sephardic schools changed their language of instruction to French, and Ladino didn’t remain the main language of Sephardic Jews beyond the 19th century. Yiddish became the universal language for Eastern European Jews, but Ladino never did for Sephardic Jews. NO TRACTION IN THE U.S. Besides its archival gaps, Ladino never garnered particular respect in American Jewish spaces. In the 19th and 20th centuries, the majority of Jews who immigrated to the U.S. came from countries such as Germany, Russia, Poland and Ukraine. When Ladino-speaking Sephardic Jews came to the U.S., they felt like they didn’t fit in with their own people. People would ask Ladino-speaking immigrants: “How could you be Jewish if you don’t know Yiddish? How could you be Jewish if you don’t eat matzah balls? How could you have a name in Greek and be Jewish? Halio, who practices family medicine in Long Island, New York, grew up hearing Ladino and took it upon himself to learn the language. Now, he’s working with the American Sephardic Federation, which co-sponsored the International Ladino Day, to teach the language to anyone interested. While some like Halio want to ensure more people are learning the ancient language, Naar at the University of Washington is working to preserve its history. After Naar got the job as founding chair of Sephardic studies, people started bringing him documents in Ladino, asking for translations. “A lot of families had held onto their cultural family heirlooms even though most couldn’t read or understand the language,” he said. Naar and a team at the university work to make sure these family histories are preserved. Naar launched a call for people to bring him Ladino texts — and it’s been remarkably successful. They’ve now digitized about 150,000 pages of Ladino, one of the largest Ladino libraries in the world. “I saw myself as trying to serve as an interpreter for them, to bring their ancestors to life,” he said. 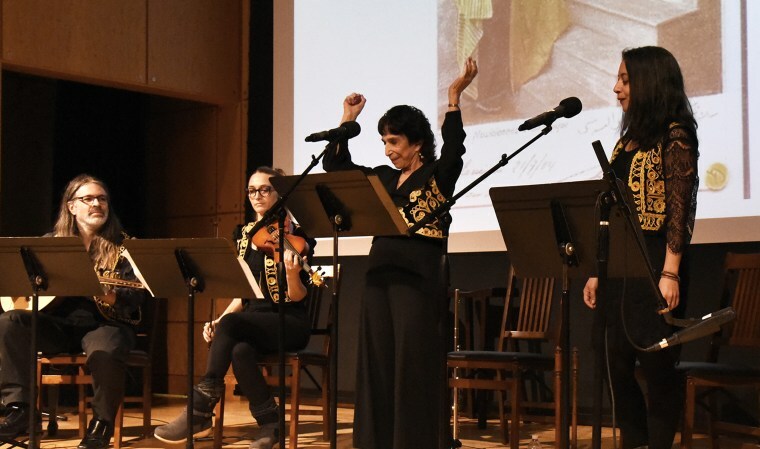 At the International Ladino Day, the desire to keep the language alive was palpable. Sisters Megan, 29, and Kara Lieff, 26, drove down from Western Massachusetts for the day to learn more about the language. “Our grandparents lived in a whole community of Turkish-Ladino speaking Jews in Philadelphia, but that heritage didn’t get passed down,” Megan said. As the day drew to a close, attendees of the sold-out event stayed around, ate Sephardic snacks and mingled in the satellite room, where guests who couldn’t fit in the main auditorium heard speeches from Ladino experts and listened to the Alhambra Sephardic Music Ensemble perform. One group of people talked about their dreams of going on a Ladino heritage tour, and when someone else overheard, she quickly abandoned her conversation in Spanish to tell them in English about her trip to the Balkans and Turkey. In the corner, an elderly couple munched on baklava.